this website is focused on those that choose to jump off the skyway bridge of their own accord and less about the iconic structure that greets tourists as the gateway to tampa bay. if you're looking for politically correct vacation information about the area, you will not find it here. 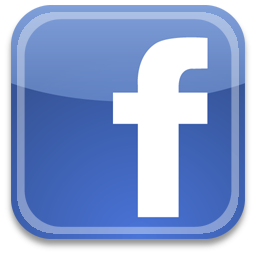 this site is primarily driven by our visitors that offer input on skyway bridge jumper activities and our multitude of facebook friends. our gratitude to these contributors is tremendous, for without them, this site could not be. we are also very thankful to and for the contributions from the tampa bay area media. although their skyway jumper coverage can be spotty at times, they can come through when they want to. we would also like to commend the men and women of the various police, fire, marine, and medical services, that rise above the average call and perform their jobs in this less than standard location. thank you one and all and always be safe. read this site for awhile and you may be confused at our stand on suicide and the bridge. we strongly support anyone's need and desire to take their own life by their own hand, anytime they choose to do so. we would like to see them seek help, but it's their business why they do it, not ours, not yours. we do hope they have good reason and are not doing it on impulse for some stupid reason, like "she don't love me anymore" or "i lost my job". their choice of jumping off the skyway bridge is unfortunate, as it is so very public, it does tie up traffic, and it creates a scene involving several agencies and many people, some of whom occasionally sustain injuries during jumper events. more important, this type of exposure opens up the family to public scrutiny, condemnation, and ridicule, especially for the children of jumpers. they never get over the hurt and humiliation that comes with it. we tend to see this extremely public method of suicide as selfish. if someone is in terrible pain or at life's end and just wants it to stop, it is our contention that if they wish to self eliminate, that they do so thoughtfully, privately, and with as little mess as possible. do your research, make your plan, tie up lose ends to the best of your ability, and be respectful of others before you clock out for the last time. it's not just all about you. we are also of the belief that professional assistance with ending one's life, should be accorded to those that wish to do so, regardless the reason, with dignity and privacy, as opposed to allowing those that truly need it, to seek it out on their own, by throwing oneself from a bridge or some other method, often with various hit or miss results. ending one's own life is one of the only real things we have control over. we admire and appreciate the efforts people make in the continual promoting of AIDS and breast cancer awareness. we all march, wear pink, and do what we can. while these are indeed gallant efforts, perhaps more could be done in making mental illness awareness just as prevalent, if not more so. the damage done to society in general because of mental illness, is far more staggering than most all other afflictions combined. the further damage done with the cornucopia of legal, life destroying headmeds, are not helping the situation. we are a very mentally ill society and until we address these issues, things will only get worse. you can argue this all you want, but this is our website, so shut it. this website started as jumperpool.com in may of 1998. site visitors could guess when the next jumper would leap into the afterlife. during that time, we had over 5000 guesses. as the site became more focused on jumper prevention, the jumper pool guessing feature was discontinued. starting in 2011, skywaybridge.com became a site dedicated to reporting skyway jumpers the same as before, along with other pertinent skyway related news and information. many are still upset with it just the same. oh well. is this site in bad taste? to some, yes, others, no. is it illegal? not yet. part of being in this land of the free, is that we are free to do things that others might find offensive, rude, crude, and socially unacceptable. political correctness has created 'social justice warriors' that want to strip away the freedoms we take for granted, simply because they may offend someone. we can not let that happen. we must fight these 'progressive' alt-left extremists. there should be no 'safe spaces' against 'trigger' words. as of this writing, there is no law against being offended. it's just a state of mind a person needs to get over. we need to remain free to be stupid and do stupid things. think we're wrong? ever watch jerry springer? ever go out in public? as long as we do not cause harm to others, we are pretty much free to say and do as we please. for now at least. the argument may be made that this site does cause harm to the jumpers and the friends and families of the jumpers. we believe it's only the jumpers themselves that cause the harm. we repeatedly suggest that would be jumpers not jump. we insist that the friends and families of jumpers stay away from this site. don't read it. don't tell anyone about it. boycott and protest, it's your right. get a lawyer, shut us down. censor the internet! maybe create your own website dedicated to the prevention of jumpers or suicide in general. some say that we can not possibly know the pain suicide brings. they are wrong. we have had one suicide (flung himself off a bridge into the path of a semi-truck, splat) and one known attempted suicide (deliberate intake of poisonous mushrooms) in the family. we do know suicide hurts families. trust us, most of our family members stay away from this site and find it useless. isn't freedom wonderful? this site does not glorify the death part of jumping from the bridge. that is just the usual conclusion. we firmly believe that this site works in the prevention, not the promotion, of skyway bridge jumpers. we know it has deterred a few that have viewed this site. it is stated throughout these pages, that if you do not want to be included on this site, then do not jump. we beg people not to jump from the bridge. we offer at least two links to our suicide prevention help page on every page. we plead with them to get help, do not jump. if they choose to jump, then they know their actions and family turmoil may end up on this website. this site actively promotes an anti-suicide jumping device in the hopes that someone in government will wise up to the fact this thing could help hinder skyway suicide jumpers. suicide hotlines and additional trooper patrols do help, but this device could do the trick or at least, give the troopers some additional crucial response time. we are also calling the public to action, in an effort to force the bridge trolls in charge to end the jumper madness. any and all information posted on this website about public jumpers off the public skyway bridge, is gathered from publicly released items, submitted by site visitors, and/or jumper event witnesses. we publish publicly obtained public content that is made available publicly for the public. this includes items such as pictures, videos, press releases, news articles, obituaries, guestbooks, arrest records, and items publicly posted to other websites, such as facebook, youtube, the google, mydeathspace, twitter, and various other public sources on these here public intertubes. skywaybridge.com does not post a jumper's home address and feels there is no reason why this information is made public. it should not be released publicly by anyone. anyone wishing to send us private information or visual contributions with a request to keep it off this website, may do so with the confidence that we will not post your submissions, as requested, unless you are attacking us and leave us no recourse to reply. you may submit any and all information under an assumed name or no name at all. your email address, if provided, will never be used recklessly, harassingly, given away, sold, or put on any mailing list, even if you hate all this. skywaybridge.com is a free website. there is no need to become a member or login. this presentation costs you nothing but lost time you will never get back. ads found on this site should not interfere with your visit, unless you chose to access them. we started running ads in 2011, since you cheapskates won't donate a lousy dollar. making purchases by clicking through our ads will cost you nothing extra, while giving us a small taste. donations and ad revenue go to paying for website hosting bandwidth, software upgrades, and an occasional adult beverage. finally, if you like this site, we're glad to have you as a reader and perhaps a contributor. do return again. if you do not like this site, at least you read this page. perhaps you wish to now go hate on us. better yet, buy this website and give it a different direction or make it gone. isn't freedom wonderful? what we think about suicide and the skyway bridge. "the operators of skywaybridge.com declined to be interviewed on the record or to identify themselves. this stance is a direct response to false reporting and outright lying in the past. thanks, but no thanks." if you have questions to ask by email, have at it. if you wish to contact someone through this website, give it a shot. this graphic depicts the layout of our jumper incident reports. date: incident, time, male/female, hit?, used crisis phones?, saved/lived/died, body found? jump news reporter reports, images, and etc., in order of arrival. publicly available information: social media, obituary, images, arrests, etc. 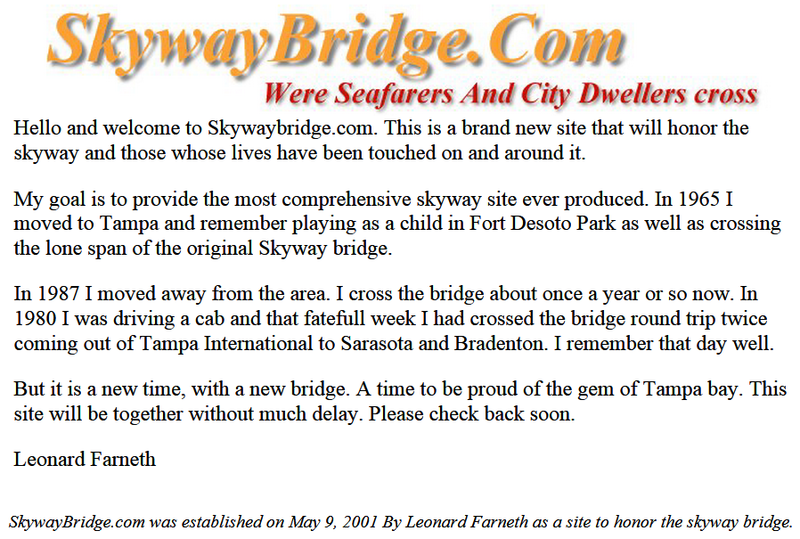 skywaybridge.com from 05.09.01 to when we acquired the expired domain on 12.09.03.